Lacy Moffett with a group of Chinese ministers, n.d. Between 1932 and 1940, the work of foreign missionaries in China became entangled with the internal revolutionary struggles of the nation and the military aspirations of Imperial Japan. These were pivotal years for both China and the missionary effort. By the end of the period, most western missionaries, including Rev. Lacy Moffett and his family, were faced with a soul-searching dilemma: to continue their life’s work in the face of political turmoil and physical danger, or to return to the United States. Christian missionaries to China and elsewhere served in the belief that every soul could be saved, that every individual deserved an opportunity to develop his or her God-given capacities. For missionaries, this meant all the peoples of the world should have access to the elements of Christianity and Western civilization. By the end of the 19th century, economic and social conditions in the United States were aligned to initiate a world-wide Christian outreach. Many leaders viewed it as a time to prove the dominance and prestige of Western civilization. The rising nationalism of the era provided an additional motivation for the foreign missionary enterprise. In 1891, the Student Volunteer Movement for Foreign Missions  set an ambitious goal for the “evangelization of the world within a generation.” In this environment, foreign missionaries became heroes and heroines for the American public. 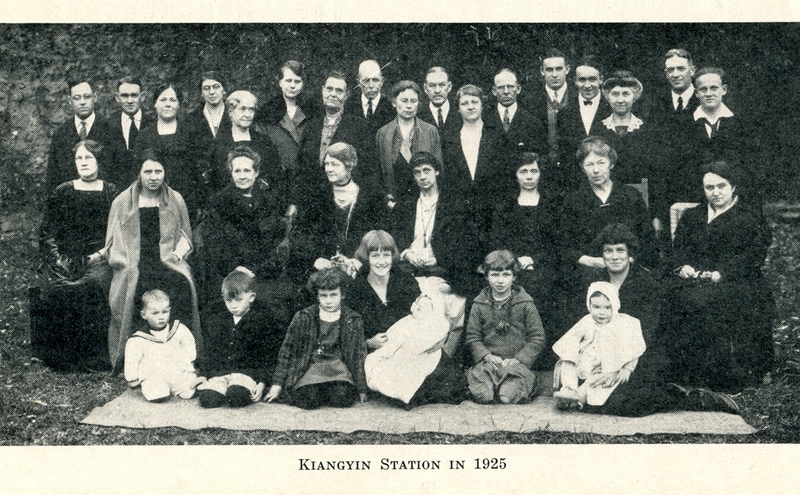 Missionaries in Kiangyin (Jiangyin), 1925. Lacy is far right. Kate is in the middle, seated. Lacy Moffett (1878-1957) was destined from birth to become a missionary minister. His Scotch-Irish ancestors arrived in the American colonies before the Revolution seeking the opportunity to worship freely and govern themselves. All were Presbyterians, and many were of the strict Covenanter  persuasion. The Moffetts’ commitment to the church led them to take on leadership roles, often serving as ministers and elders. Over the years, the strict fundamentalism of the original Covenanters moderated, but the Moffetts remained steadfast to the teachings of the Bible and their church. Family of Alexander Stuart Moffett, n.d. I feel that my life-work: the work God is given me to do now; is to train my darling children for God and His service; as missionaries; ALL of them if it be his will. I have consecrated each one of them to this work—A Missionary life—the grandest life they can live. Six of the couple’s eight children eventually served in China. Another Moffett child, Harry, became the chaplain at Davidson College. 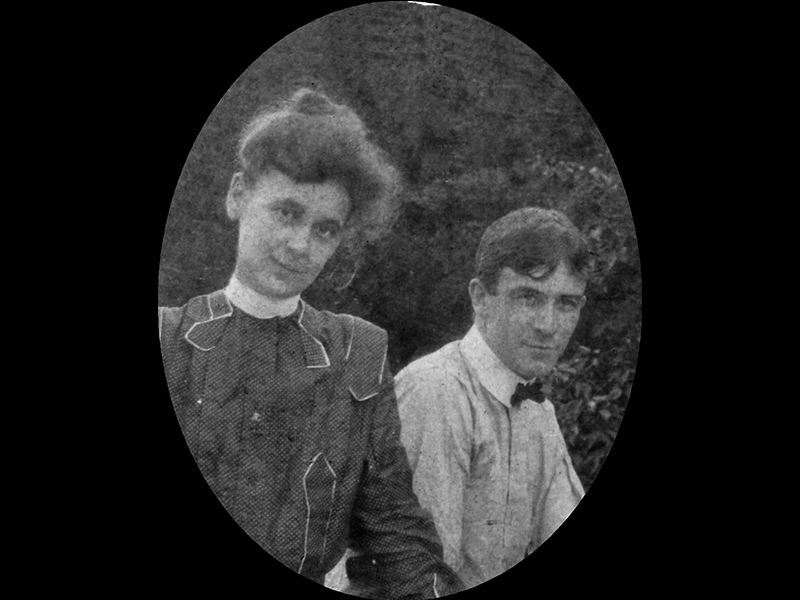 Kate and Lacy Moffett, circa 1904. Lacy graduated from Center College in Kentucky and completed his theological training at Union Theological Seminary in Virginia. He graduated in 1902 and felt the call to missionary work, but realized the need to develop support for missions in the home church. He, along with John Leighton Stuart , spent two years traveling the South promoting missions. It was during those travels that Lacy met his future wife, Kate Hall Rodd (1882-1961) of New Orleans. 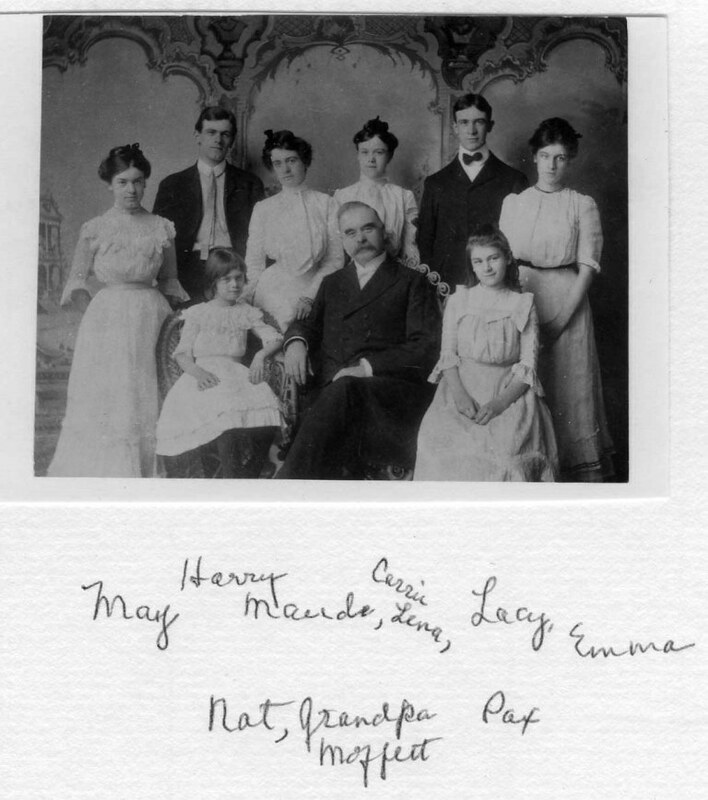 Kate and Lacy were married on November 17, 1904, and left almost immediately for China to serve as missionaries for the Presbyterian Church in the U.S. They arrived in China in late December 1904 and transferred to the Jiangyin Station in September 1908. 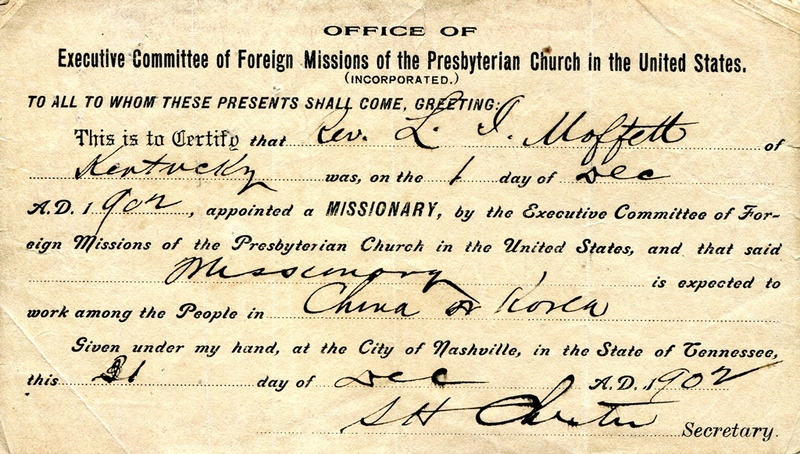 Lacy Moffett's missionary license, 1902. The span of [Lacy Moffett’s] missionary life was a turbulent and boisterous era—the revolution and overthrow of the Manchu dynasty, the beginnings of the Republic of China, the terrible “Warlord” years, growing nationalism and resentment over many real and imagined oppressions by the West, the early years of Communism, the rising threat of Japan, and finally the war itself—all these came within his missionary lifetime. Alternately, the American missionary was the hero or the black villain of the occasion. The strains and the stresses of years cannot be fully understood or appreciated by any except those who experienced them. The political chaos within China served as a backdrop for the Japanese attempt to annex large portions of China. In January 1932, the Japanese launched their assault on China, the beginning of the Second Sino-Japanese War , which would eventually lead into World War II. Their first target was Hongkew, the Chinese section of Shanghai. Shanghai also had large sections which were controlled by British, French, and other foreign nations. These protectorates had been established as part of earlier treaties with Imperial China. Initially, the Japanese respected these treaties—they were not ready to confront the Western powers. How we do thank God for the way the work of God’s kingdom is going right ahead under the leadership in large measure of the consecrated Chinese workers. The day is certainly coming when there won’t be much real need of missionaries in many of our stations. 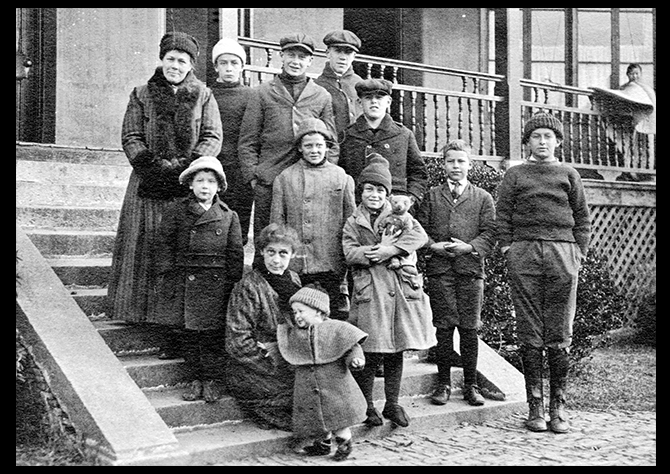 The Moffetts and other station children at Christmas time, Jiangyin, 1919. Kate is in front. Carrie Lena Moffett, Lacy's sister, is in back. Weather very cold and wet….Found Zao there holding service in home of nephew of Koong Pah-kao. Li Yao kang, Dzi Hoong sen and Dzi Yoh dong, who were expected to help in meetings, did not come….Held Bible study each morning in Tsae house used as chapel. Zao spoke in afternoons. Too wet for night meetings. Attendance of about 50 Christians and 94 enquirers daily….Tsae house has been secured as chapel, mortgaged as long as needed for a nominal $100. The work was not glamorous but was consistent with the goal of preparing the Chinese to assume ownership of their church. 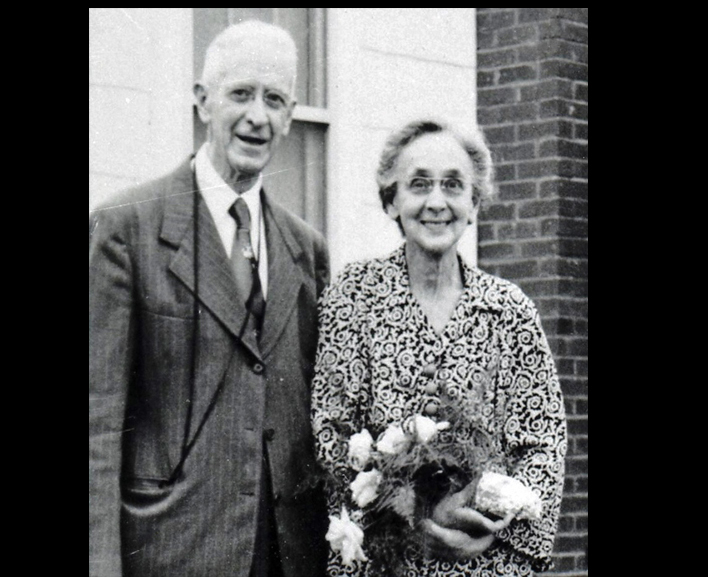 In 1936, Alex Moffett, the oldest son of Lacy and Kate, and his new wife, Virginia, joined the mission in Jiangyin. Alex had recently completed his medical training and was assigned to the mission hospital. Another son, Irvine Moffett, also returned to China. Life and work in Jiangyin continued near normal, although Chinese preparations for a war with Japan were obvious. In June 1937, Kate, Lacy, and their youngest daughter Catherine (Cai) returned to the United States for their regularly scheduled furlough. Alex, his wife, and Irvine remained in China along with Irvine. Shortly after the Moffett’s left China, the Japanese launched a full-scale invasion that is remembered by history for its brutality . 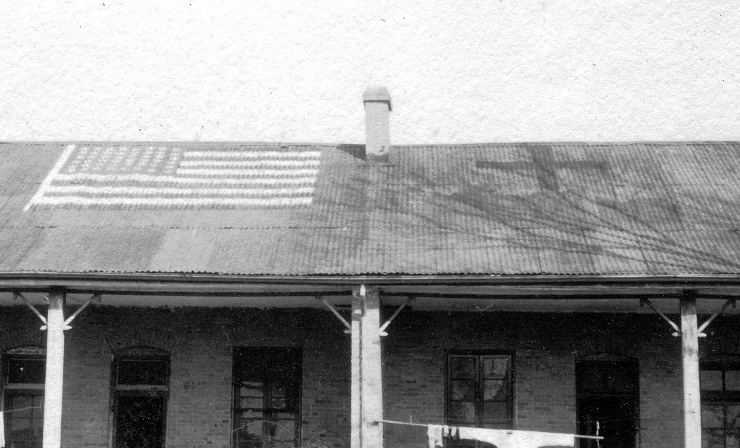 Photo showing American flag painted on the roofs of mission buildings, circa 1937. The city of Jiangyin is strategically located near the mouth of the Yangtze River, and the Chinese had constructed massive fortifications in anticipation of an assault. Their preparations proved no match for the superior air and land power of the Japanese, however. The city fell on December 1, 1937. The mission had prepared for a possible Japanese air attack and painted “USA” and the symbol for “hospital” on the hospital roof. Despite these measures, the station was bombed. A week later, Japanese soldiers entered the compound, stripped the buildings of their contents, and set them afire. Seventeen of the twenty buildings were completely destroyed, including the Moffett home. Just prior to the Japanese attack, all of the foreign missionaries at Jiangyin evacuated to Shanghai. Irvine Moffett followed the progress of the Japanese invasion closely from Shanghai and kept a war journal. In the following entry, he records an account of the conditions at Jiangyin during the occupation as related to him by Pastor Wu, a Chinese minister who had just arrived from the station. At first, everyone Chinese who was seen was shot—in both the city and the country. He said that it was safer now, that if one could keep a stiff upper lip and not show fear, that he could go many places and remain safe, that is as long as the [Japanese] or Chinese bandits did not get him. He said that at the outset of the [Japanese] occupation, the [Japanese] soldiers would drive down the highway and when they saw workmen in the fields, they would simply stop the car and get out, take aim and shoot the poor farmers in cold blood for no other reason than their own pleasure at slaughtering people. 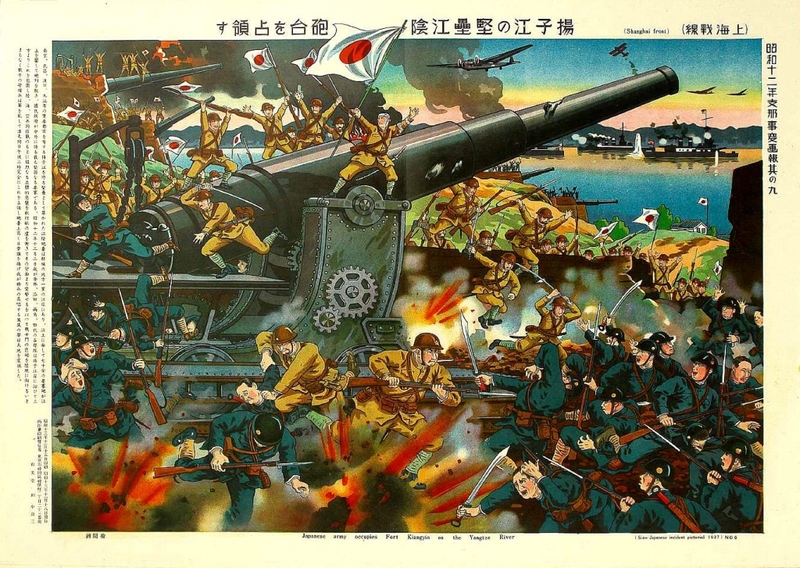 Japanese propaganda poster showing their victory in Kiangyin, 1937. At the end of their furlough in November 1938, at a time when many missionaries and other foreigners were leaving China, Lacy, Kate, and their daughter returned. There is no first-hand account of the deliberations and thought processes that went into their decision, but some reasonable assumptions can be made. The Moffetts would have been completely aware of the situation at the Jiangyin station and the escalating Japanese siege of China. The American Consulate in China was advising all foreigners to leave the country. But for the Moffett family, Jiangyin was more than a station, it represented their life’s work and their home. Perhaps even more relevant to their decision would have been the lesson of the parable of the Good Shepherd, “I am the good shepherd; the good shepherd lays down His life for the sheep.” How could Lacy abandon his flock? Alex and I are sitting in our room upstairs in the Chinese Doctor’s house writing by oil lamp for the electric light plant was burned. We are gradually getting some repairs made to the buildings that are left….The country is far from quiet yet, but I think we will be safe enough here, though subject to many inspections and much red tape which will not be altogether pleasant. We are frequently searched for arms and our baggage examined, usually with reasonable courtesy, and I have never had anything taken. One soldier searching my houseboat did appropriate some eggs from my food supply, but I gave them to him and added two more for which he thanked me very politely. Because of the potential danger and the lack of facilities at Jiangyin, Kate remained in Shanghai. She began working with Jewish refugees who had fled from the Nazis in Europe. Shanghai was one of the few havens in the world that would accept them. She taught them English with the thought that it would help them to immigrate to America once restrictions were lifted. 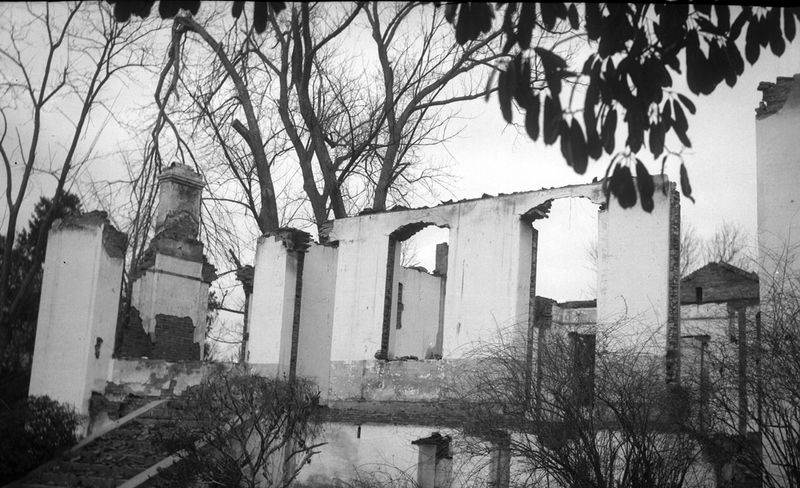 Moffett home after its bombing in 1937. As you see, we are HERE! This is a grand old place, even tho there are indeed some sad changes since we left….If only you could see us in our new “Mission Court”… you would find us a mighty happy trio, Irv and Daddy and I. Our stay in the country was quite nice. The young pastor there is doing good work and he and Daddy examined 104 enquirers and received ten into the church. The little chapel was quite filled on Sunday morning….I find it easy to spend much of my time while out in the country with Daddy, teaching the little hymn choruses to the many women and children who come. For the next year, the mission’s work continued, an island of civility in a sea of conflict. Difficulties are rarely mentioned in the letters Kate sent to the family in the States, most likely because Japanese censors checked all mail before it left China. We felt that [leaving] was the right thing to do under the circumstances….Don’t worry about us. Our times are in His hands. On November 3, 1940, Lacy, Kate, Irvine, and Cai boarded a ship for the United States, marking the end of thirty-six years of ministry in China. Lacy and Kate Moffett's 50th wedding anniversary, 1954. Finally, on October 2, 1957, after several days of deepening weakness, the bonds of the body were loosed and he went quietly on to the Master whom he had loved and served all the days of his early life. There were many to greet him—loved ones and Chinese who had first heard the words of Life from his lips. Following the war, the ensuing internal struggle within China ended with the establishment of a communist government  in 1949. The country was effectively closed to foreign mission work, but the seeds of Christianity planted by the missionaries survived. After years of darkness and drought, they would eventually sprout and blossom. 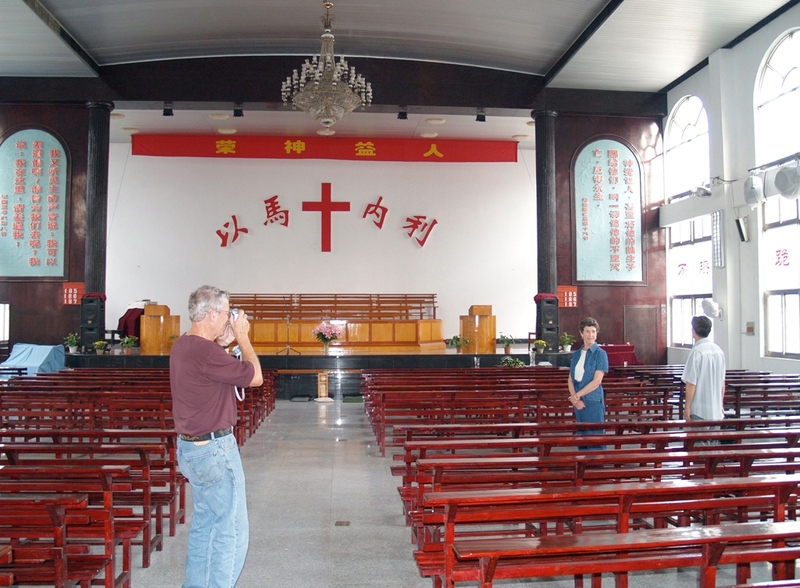 Interior of the Jiangyin church, n.d. With "Sandy" Moffett--son of Alex Moffett, grandson of Lacy Moffett--and Sandy Moffett's wife, Betty. In 2000, a message from a Chinese Christian Church in Jiangyin reached the mission’s original sponsor, the First Presbyterian Church of Wilmington, North Carolina . Following this initial contact, a member of the Wilmington congregation visited the church in Jiangyin in 2005. There, he discovered a modern church and a thriving Christian community with over 1,000 members. Dale Dailey is a retired engineer from DeWitt, Michigan, who now serves as family historian. Both of his wife's parents were born and grew up in China, the children of missionaries. All images used in this post were provided by Mr. Dailey, who will be depositing items related to Lacy Moffett at PHS. For further reading on the Moffett family, see American Presbyterians: Journal of Presbyterian History, Summer 1987 , "Into the 'Region of the Dead': Itinerating in China in the 1930s," by Lawrence D. Kessler. The article is based primarily on a journal kept by Lacy Moffett. Order The Journal here . Become a PHS Fellow-level member and gain access to 100 years of The Journal here . The Biographical Dictionary of Chinese Christianity provides short biographies for Lacy Moffett  and Kate Rodd Moffett . First International Convention of the Student Volunteer Movement meeting in Cleveland in 1891. Hocking, William Ernest (Chairman), Re-Thinking Missions: A Laymen’s Inquiry after one Hundred Years , Harper & Brothers, 1932. Moffett, Carrie Lena diary entry, September, 1890. Microfilm available at the Virginia State Archives, Richmond, Virginia. John Leighton Stuart would serve as a missionary, become the founding president of Yenching University, and after WWII, was appointed the U.S. Ambassador to China. In this article, I will use the current spelling of Jiangyin. When Westerners arrived in China, they originally translated the Chinese name of “River Shade” to Kiangyin. Professor Lawrence Kessler has written a comprehensive history of the Jiangyin Station: Kessler, Lawrence, The Jiangyin Station: An American Missionary Community in China, 1895-1951 , University of North Carolina Press, Chapel Hill, North Carolina, 1996. Worth, Charles W. “Rev. Lacy Irvine Moffett, D.D., 1878-1957. From I Have Fought the Good Fight: A Memorial , Volume IV, Board of World Missions, Presbyterian Church, U.S., Nashville, TN, pg 16. Worth, Julia S. (editor), Far and Away: Worth Family Letters from the Mission Field , Julia S. Worth, Wilmington, North Carolina, 2011, pg. 88. A set of Kate’s letters, beginning in April, 1935 until the family’s departure from China in 1940 was assembled by two of her daughters, Martha and Cai. They are now in the possession of the author. Moffett, Lacy I., “Itinerating Journal,” from February 18-20, 1936. The original journal was transcribed by Professor Lawrence C. Kessler and a copy made available to the author. Professor Kessler has written an article expanding on the subject of itinerating: Kessler, Lawrence D., "Into the 'Region of the Dead': Itinerating in China in the 1930s,” American Presbyterians, Vol. 65, No. 2 , Presbyterian Historical Society, Pages 109-116. Kessler, Lawrence D., The Jiangyin Station: An American Missionary Community in China, 1895-1951 , University of North Carolina Press, Chapel Hill, North Carolina, 1996, pg. 117-118. Moffett, Lacy “Irvine” Jr., The Shanghai War Journal of Lacy “Irvine” Moffett, Jr., Edited by Dale Dailey, November 2011. In October, 1940, the Moffett family heard a radio message from the U.S. State Department to Americans living in China saying, “All Americans prepare to evacuate by December 21, 1940, from China, Korea, and all parts of the Japanese Empire.” Subsequently, the Mid-China Mission instructed all missionaries to evacuate by December 1. Worth, Charles W. “Rev. Lacy Irvine Moffett, D.D., 1878-1957. From I Have Fought the Good Fight: A Memorial , Volume IV, Board of World Missions, Presbyterian Church, U.S., Nashville, TN, pg 18. Green, Amanda, “Hanna has visitors all the way from China ,” Star News Online, September 6, 2008.